1. A second coat of arms is used in Scotland. The United Kingdom of Great Britain and Northern Ireland, called the United Kingdom, GB or UK, is a sovereign state in Western Europe. It is made up of four countries: England, Northern Ireland, Scotland and Wales. It is a member of the European Union, the United Nations, the Commonwealth, NATO and the G8. It has the sixth largest economy in the world. About 63 million people live in the UK. Most people in the UK speak English. There are five native languages other than English. They are Welsh in Wales, Gaelic and Scots in Scotland and Northern Ireland, Irish in Northern Ireland, and Cornish in Cornwall. Between the 17th and mid 20th-centuries Britain was an important world power. It became a colonial empire that controlled large areas of Africa, Asia, North America and Oceania. Today this empire does not exist, although Britain keeps links with most countries of its former empire. Some well-known cities in the UK are London, Edinburgh, Cardiff, Belfast, Manchester, Liverpool, Birmingham, York and Glasgow. Archaeological remains show that the first group of people to live in the British Isles were hunter-gatherers after the last ice age ended. The date is not known: perhaps as early as 8000BC but certainly by 5000BC. They built mesolithic wood and stone monuments. Stonehenge was built between 3000 and 1600BC. Later, Celtic tribes arrived from mainland Europe. Britain was a changing collection of tribal areas, with no overall leader. Julius Caesar tried to invade (take over) the island in 55BC but was not able to do so. The Romans successfully invaded in 43AD. History begins when there is a written record. Writing, like so much else, was brought to Britain by the Romans. Rome ruled in Britain from 44AD to 410AD, but they only ruled England and Wales. The Romans never ruled Scotland north of the Clyde-Forth valley, or Ireland; their northern boundary varied from time to time, and was marked for a while at Hadrian's Wall. After the Romans, two waves of immigrants came to Britain. The first were German tribes: the Angles, Saxons and Jutes. English, the language, is a development from Anglo-Saxon Old English, and is a Germanic language. The second were the Vikings. After a long period when England was split into various kingdoms, it was finally made into one country by Æthelstan (Athelstan) in 945AD. England and Wales were unified by Edward I (Longshanks) by force in the 13th century. This union is known as Britain. Union with Scotland took much longer; there were hundreds of years of conflicts between the two countries. This union is known as Great Britain. In 1603, when Queen Elizabeth I of England died, her closest relative was King James VI of Scotland. He became king of England as well as king of Scotland, but the two countries stayed separate. In 1707, the Scottish and English Parliaments agreed the Treaty of Union, which joined the two countries into one country called The Kingdom of Great Britain under Queen Anne. Queen Elizabeth has reigned since 1952. By 1800, both Scotland and England had already independently had much influence over Ireland for over 600 years. In that year laws were passed in Great Britain and Ireland to merge the two states. 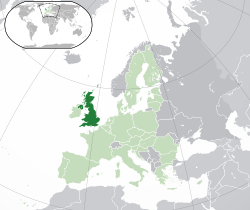 The new country was called the United Kingdom of Great Britain and Ireland. In 1922 much of Ireland became independent as the Irish Free State (now called Ireland) from the United Kingdom. However, six northern counties (called Northern Ireland) continue to be part of the United Kingdom. The country was renamed The United Kingdom of Great Britain and Northern Ireland. The British people today are ruled by Parliament, not by monarchs. Parliament started a thousand years ago as an advisory body for the monarch, but by the 17th century it had gained enough power to successfully defeat Charles I, in the English Civil War. Oliver Cromwell became Lord Protector. Though the monarchy was restored after his death, the Crown slowly became the secondary power, and Parliament the first. Members of Parliament (called MPs) were elected, but until the early twentieth century, only men who owned property could vote. In the nineteenth century, more people were given suffrage (the right to vote), but even so, by 1900, women could not vote, and only 40% of men were rich enough to vote. But in 1928, all adults, male and female, got the vote: this is called universal suffrage. Parliament is in London, but it has power over the whole of the UK. Today, Wales, Scotland and Northern Ireland each have their own parliaments as well, but they have more limited powers. There are also parliaments in the Isle of Man and the Channel Islands, which are islands that are partly controlled by the UK, and partly independent. The members of Parliament belong to political parties: the biggest parties are the Labour Party, the Conservative Party and the Liberal Democrats. Members of the same party agree to act and vote more or less together. A party with more than half the seats (a majority) forms the government; the leader of the party becomes the Prime Minister, who then appoints other ministers. Because the government has a majority in Parliament, it can normally control what laws are passed. Major languages spoken in the United Kingdom other than English include Polish (500,000 - approximate number of speakers in the United Kingdom), Eastern Panjabi or Punjabi (471,000), Bengali (400,000), Urdu (400,000), Cantonese (300,000), Greek (200,000), Southwestern Caribbean Creole English (170,000). The UK is made up of four different countries: Wales, England, Scotland and Northern Ireland. The capital city of Wales is Cardiff. The capital city of England is London. The capital city of Scotland is Edinburgh and the capital city of Northern Ireland is Belfast. Other large cities in the UK are Birmingham, Bristol, Manchester, Liverpool, Newcastle upon Tyne, Leeds, Sheffield, Glasgow, Southampton, Leicester, Coventry, Bradford and Nottingham. The weather of the United Kingdom is changeable and unpredictable. Summers are moderately warm, winters are cool to cold. Rain falls throughout the year, and more on the west than the east. The reasons include its northerly latitude and the warm water from the Atlantic Ocean's Gulf Stream. The usually moderate prevailing winds from the Atlantic may be interrupted by Arctic air from the north-east or, less often, hot air from the Sahara. The UK is a parliamentary democracy based on a constitutional and hereditary monarchy. The people of the United Kingdom vote for a members of Parliament to speak for them and to make laws for them. Queen Elizabeth II is the queen of the UK and is the head of state. Even though she is the head of state, she does not actually govern the country. The government, led by the Prime Minister, governs the country and decides policy. Today, the Prime Minister is David Cameron, who is the leader of the Conservative party. Parliament is where laws are made. It has three parts: the House of Commons, the House of Lords, and the Queen. The House of Commons is the most powerful part. It is where Members of Parliament sit. The Prime Minister sits here as well, because he is a Member of Parliament. The people who sit in the House of Lords are called peers: they are not chosen by the people. Most peers are now appointed by the government. There are some who are hereditary peers (their fathers were peers); and a few others, such as certain bishops in the established Church of England, and the Judiciary (Law Lords). Scotland has its own devolved Parliament with power to make laws on things like education, health and Scottish law. Northern Ireland and Wales have their own devolved Assemblies which have some powers but less than the Scottish parliament. The UK Parliament remains sovereign and it could end the devolved administrations at any time. The UK has a military of around 223,000 people, not including reserve forces. The UK has one of the most advanced military in the world, alongside such countries such as the USA and France, and operates a large army (British Army), a sizable navy (Royal Navy) and air force (Royal Air Force). From the 18th century to the early 20th century, the UK was seen as the most powerful nation in the world, with a huge navy (due to the fact it was surrounded by sea, so a large navy was the most practical option). This status has faded in recent times, but the UK remains a member of various military groups such as the UN Security Council and NATO. It is also still seen as a great military power. The UK is a developed country with fifth largest economy in the world. It was a superpower during the 18th, 19th and early 20th century and was considered since the early 1800s to be the most powerful and influential nation in the world, in politics, economics (For it was the wealthiest country at the time.) and in military strength. Britain continued to be the biggest manufacturing economy in the world until 1908 and the largest economy until the 1920s. The economic cost of two world wars and the decline of the British Empire in the 1950s and 1960s reduced its leading role in global affairs. The UK still has strong economic, cultural, military and political influence and is a nuclear power. It is a member state of the European Union. The UK holds a permanent seat on the United Nations Security Council, and is a member of the G8, NATO, World Trade Organization and the Commonwealth of Nations. London, the capital, is famous as being the largest centre of finance in the world, along with New York City in the United States. William Shakespeare is perhaps the most famous English playwright. He wrote plays in the late 16th century including Romeo and Juliet and Macbeth. In the 19th century, Jane Austen and Charles Dickens were popular novelists. Twentieth century writers include the science fiction novelist H.G. Wells and J.R.R. Tolkien. The children's fantasy Harry Potter series is written by J.K. Rowling. Aldous Huxley was also from the United Kingdom. English literature is written by authors from many countries. The UK has eight Nobel laureates in literature. Seamus Heaney is a well-known writer who was born in Northern Ireland. Arthur Conan Doyle from Scotland wrote the Sherlock Holmes detective novels. He was from Edinburgh. The poet Dylan Thomas has brought Welsh culture to international attention. Britain's most well known universities include the University of Cambridge and University of Oxford, as well as the London universities (University College London, the London School of Economics, King's College London and Imperial College London) which collectively form the 'Golden Triangle' of UK universities. Road traffic in the United Kingdom drives on the left hand side of the road (unlike the Americas and some of the rest of Europe), and the driver steers from the right hand side of the vehicle. The road network on the island of Great Britain is extensive, with most local and rural roads having evolved from Roman and Medieval times. Major routes developed in the mid 20th Century were made to the needs of the motor car. The high speed motorway (freeway) network was mostly constructed in the 1960s and 1970s and links together major towns and cities. The system of rail transport was invented in England, so the United Kingdom has the oldest railway network in the world. It was built mostly during the Victorian era. At the heart of the network are five long distance main lines which radiate from London to the major cities and secondary population centres with dense commuter networks within the regions. The newest part of the network connects London to the Channel Tunnel from St Pancras station and is built to the same standard as the French TGV system. The network is part privatised, with privately owned train operating companies providing service along particular lines or regions, whilst the tracks, signals and stations are owned by a Government controlled company called Network Rail. The system of underground railways in London, known as the Tube, has been copied by many other cities. Most domestic air travel in the United Kingdom is between London and the major cities in Scotland and the North of England. London-Heathrow is the nation’s largest airport and is one of the most important international hubs in the world. Other major airports with principal international service include London-Gatwick, Birmingham, Manchester and Glasgow. An extensive system of ferry networks operate between the Scottish islands, and major ferry routes operate between England and France (via the English Channel), Scotland-Northern Ireland (via the Irish Sea) and England/Wales-Republic of Ireland (from Liverpool/Holyhead). ↑ "Directgov: English language – Government, citizens and rights". Directgov. http://www.direct.gov.uk/en/Governmentcitizensandrights/LivingintheUK/DG_10012519. Retrieved 23 August 2011. ↑ "Commonwealth Secretariat – UK". Commonwealth Secretariat. http://www.thecommonwealth.org/YearbookHomeInternal/139560/. Retrieved 23 August 2011. ↑ "United Kingdom population by ethnic group" (XLS). United Kingdom Census 2001. Office for National Statistics. 1 April 2001. Archived from the original on 21 December 2003. http://webarchive.nationalarchives.gov.uk/20031221162206/http://www.statistics.gov.uk/StatBase/Expodata/Spreadsheets/D6588.xls. Retrieved 15 April 2009. ↑ "Annual Mid-year Population Estimates, 2011 and 2012". Office for National Statistics. http://www.ons.gov.uk/ons/dcp171778_320900.pdf. Retrieved 24 February 2014. ↑ 6.0 6.1 "2011 UK censuses". Office for National Statistics. http://www.ons.gov.uk/ons/guide-method/census/2011/uk-census/index.html. Retrieved 17 December 2012. ↑ 7.0 7.1 7.2 7.3 "United Kingdom". International Monetary Fund. http://www.imf.org/external/pubs/ft/weo/2014/01/weodata/weorept.aspx?sy=2013&ey=2014&scsm=1&ssd=1&sort=country&ds=.&br=1&pr1.x=46&pr1.y=7&c=112&s=NGDPD%2CNGDPDPC%2CPPPGDP%2CPPPPC&grp=0&a=. Retrieved 30 May 2014. ↑ "Human Development Report 2013". United Nations. http://hdr.undp.org/en/reports/global/hdr2013/. Retrieved 3 September 2013. ↑ "The Countries of the UK". www.statistics.gov.uk. Archived from the original on 2002-03-29. http://webarchive.nationalarchives.gov.uk/20020329130655/http://www.statistics.gov.uk/geography/uk_countries.asp. Retrieved 2008-10-10. ↑ English Heritage. "Stonehenge and Avebury: A World Heritage Site". http://www.english-heritage.org.uk/daysout/properties/stonehenge/world-heritage-sites/. Retrieved 2011-06-21. ↑ Gordon, Raymond G. Jr. (ed) 2005.. "Languages of the UK". Ethnologue: languages of the world, 15th ed,. Dallas, Tex. : SIL International. Online version. http://www.ethnologue.com/show_country.asp?name=gb. This page was last changed on 21 December 2014, at 10:01.